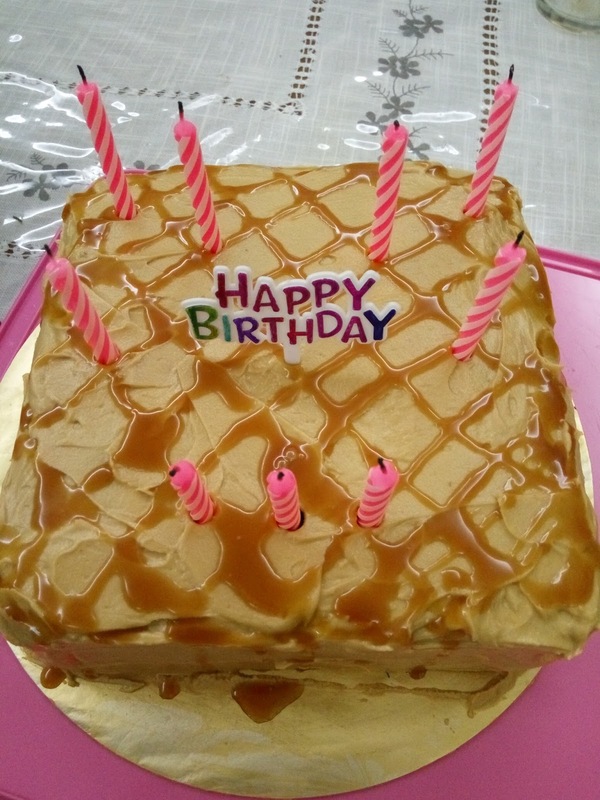 I baked this cake on Sunday to bring over to my parents' house for tea and also to have a belated birthday celebration for my mummy. Her birthday was on 24 March but at that time she was on tour in the Balkans with my dad so we haven't had a proper celebration. They came back on Saturday so to go out on Sunday seems a bit tiring for them what with jetlag and all so we had a mini celebration at their house. What's a birthday without a cake, right? I know her favourite cakes are plain butter cake and orange cake (I will make these soon for sure) but I feel that birthdays need a special cake and a plain butter or orange cake just doesn't cut it. So my Yummly app comes to the rescue. Seriously guys you should install this app on your phone, it's so easy to find all kinds of recipes be it sweet or savoury, for lunch or for dinner and for those snacks in between! Chocolate cake is my favourite and since I have all the required ingredients in the pantry, I saw this recipe aptly named Guaranteed Moist Chocolate Cake and that got me. The reviews were positive and that tempted me even more. 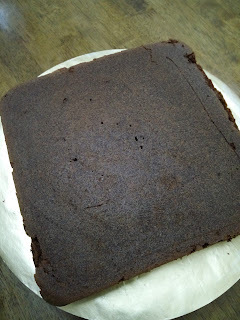 After mixing the cake, I halved the batter and baked two square cakes because I want to sandwich them together. Baking a thinner cake also reduces the baking time and minimizes the risk of the cake not cooking thoroughly, crack or rise unevenly because my oven isn't the best oven in the world. I didn't use parchment paper and only greased the baking tin with butter and flour and thankfully the cake came out almost perfect, only the edges were a bit stuck (thank God for frosting to cover the imperfections!). 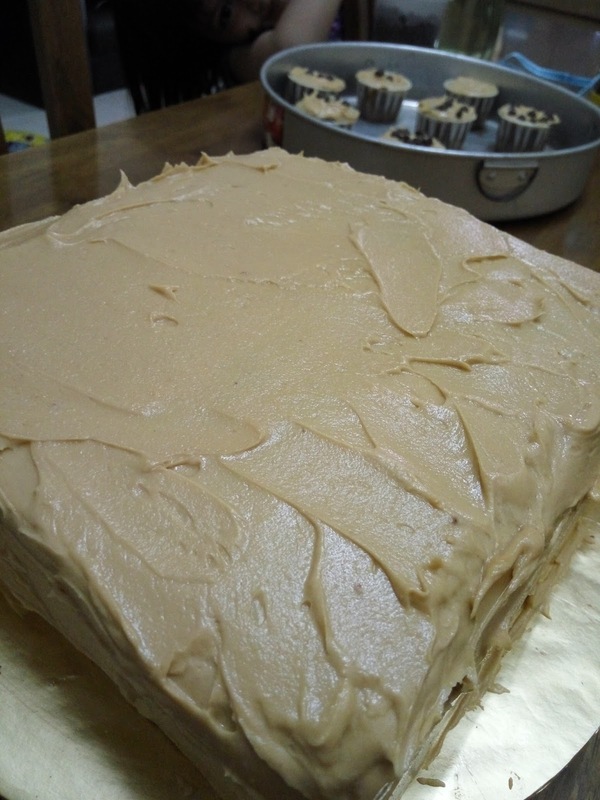 Initially I wanted to make chocolate frosting or chocolate ganache but then I thought let's make a peanut butter frosting instead. 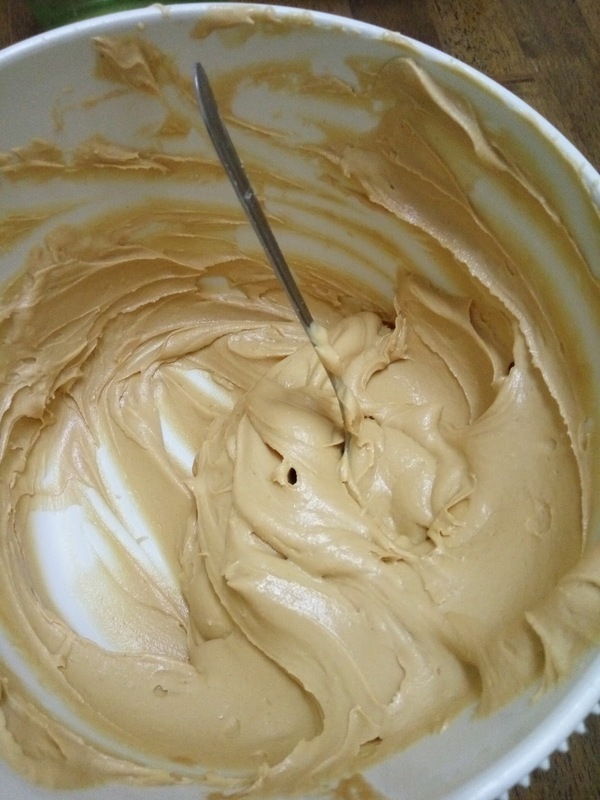 I searched for a peanut butter frosting recipe on Yummly and had to send my hubby to the shop to get me some icing sugar because I have run out. The recipe calls for a ton of icing sugar but I reduced the amount tremendously because I know the frosting will be too sweet and no one likes too-sweet icing. I got the texture that I needed and the frosting is spreadable, which is exactly what I wanted. I don't intend to pipe them anyway so I don't need stiff icing. I set down to sandwich my cakes and frosted the whole cake with the frosting. As you can see in the background, there are a few pieces of cupcakes. These days when I bake a whole cake, I will also use some of the batter to make cupcakes. 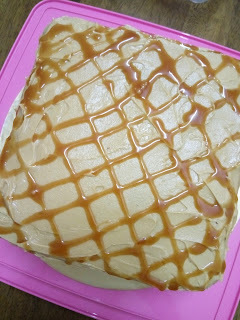 The reasons are because first, I want to check the texture and taste of the cake. Secondly, my kids sometimes will want to eat the cake but I can't be cutting the cake just yet. You know how kids are, they never take NO for an answer especially when it comes to sweet treats. So I can always give them a small cupcake to keep their mouths shut, pun intended. I asked Babycakes to help put chocolate chips on the cupcakes which she enjoyed doing while also popping several chocolate chips into her mouth while she's at it. 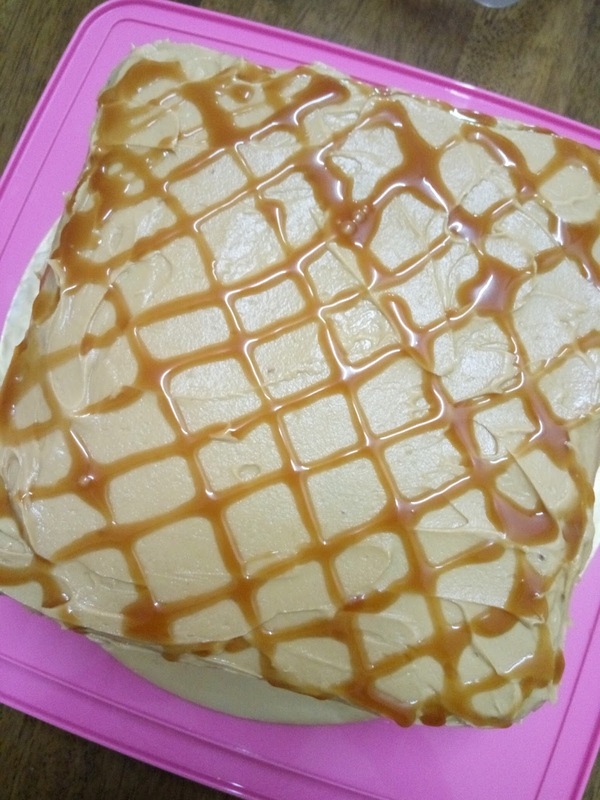 Looking that the cake was a bit too plain, I took out my salted caramel from the fridge and started to drizzle onto the cake. I seriously need to learn to control my hand and drizzle nicely because let's admit, the cake ended up messy! I wish I had just leave the cake plain hmmpph but too late. We brought the cake over to my parents' house that evening, put a few candles on it and a HAPPY BIRTHDAY cake topper. Then it's time to blow the candles and cut the cake! 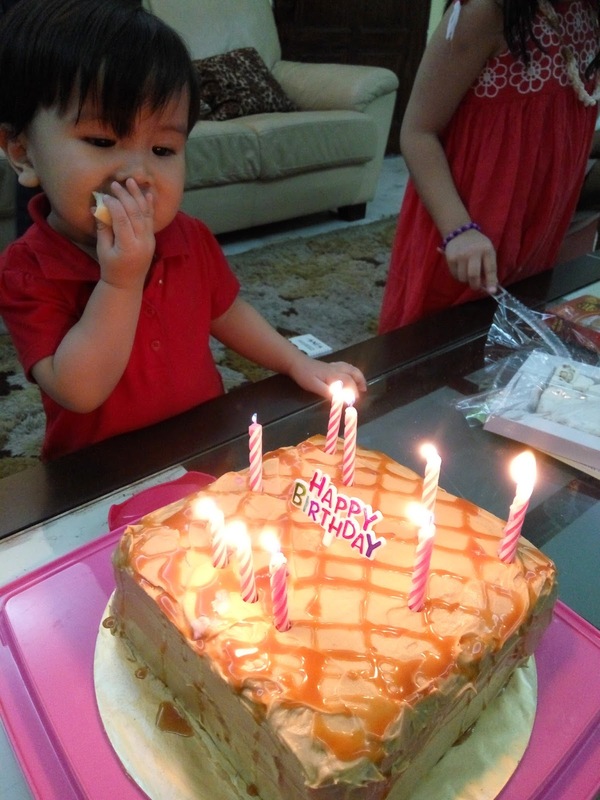 Babypie is eyeing on the cake here while stuffing his face with a piece of murtabak. This is how the cake looks like after being cut. 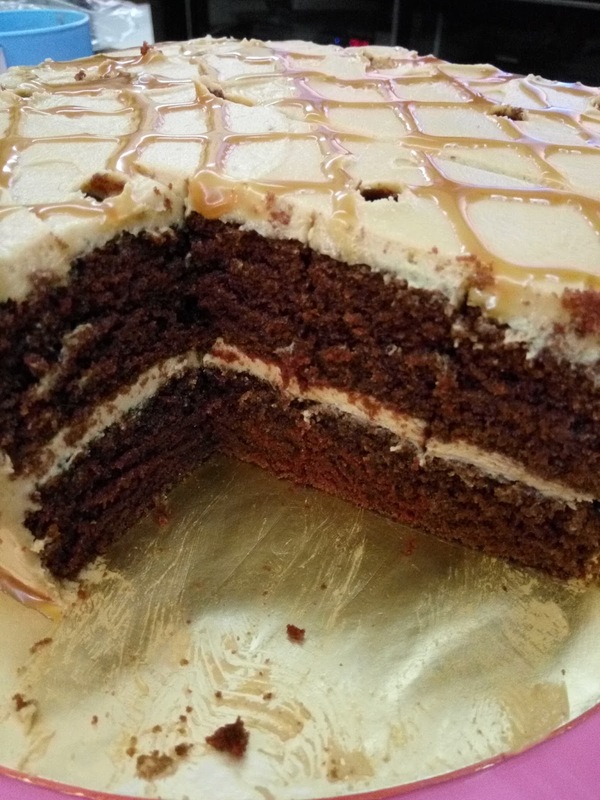 The cake is moist, soft and spongy. It reminds me of the sponge cakes we used to buy in the cake shops. The peanut butter frosting complements the cake very well too. My dad finished a slice of the cake while my mum and little brother had two slices! I can say that the cake is a winner. I am definitely saving this recipe as it is fool-proof.